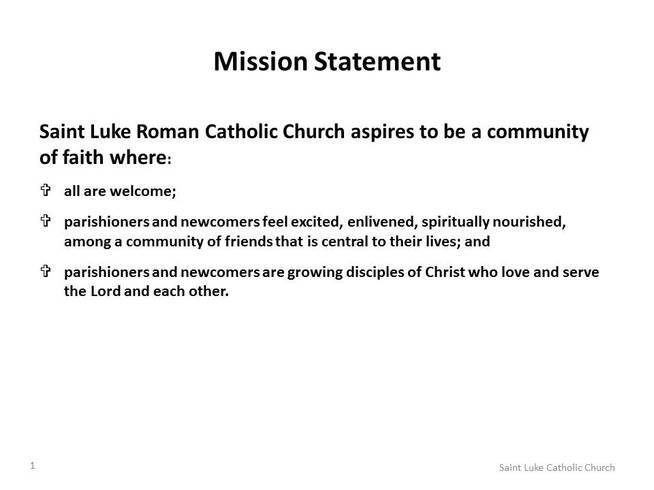 Welcome to the Saint Luke Roman Catholic Church Parish 3-year plan page! ﻿Survey results ﻿from parish survey conducted in the fall of 2014. Selection and prioritization of parish improvement projects. Our parish mission / objective statement guides development of our 3-year plan. Project opportunities are evaluated based on the "voice-of-parishioners" and alignment to our mission. Projects selected for implementation are planned systematically. Realistic timelines are set and development of project charters utilized to guide parishioner based teams through implementation. Click here to view a sample project charter. Project results are reviewed by our Parish Council to ensure proposed improvements are sustainable and foster an element of fellowship across the parish.